I have just been to the AfricaSan’s conference in Kigali, Rwanda. Upon arrival at the Kigali International Airport, I couldn’t help but start comparing with the Jomo Kenyatta International Airport, in Nairobi Kenya. I had heard a lot about how clean Kigali is. A colleague already started telling me how they had disallowed the use of plastic bags in Rwanda. It is quite a drive from the airport to the city. This gave me an opportunity to look out and get an impression of the state of cleanliness. In most African cities it is rare to drive through low income residential areas without encountering piles of garbage or overflowing sewers. This was not the case with for Kigali (chigali as the Rwanda people would pronounce it). The city is sparkling, beautifully and surrounded by many green hills. The valleys are well terraced and as we drove past the valleys I could not help think about Mathare 10 in Mathare Valley informal settlement where we’ve been doing the Urban CLTS pilot since June 2010. But I am in Kigali for AfricaSan3 with Rosie Nyawira (CCS) and Susan Kimani from the Nairobi City Council to share our Urban CLTS experiences. I remember when we began; Susan was among the few Government officers who participated in the CLTS training. She was enthusiastic from the word go. No wonder she has now become an institutional champion and our link to the City Council. She has been to countless community follow-up meetings and also to do strategic targeted triggering sessions to ensure total buy in to UCLTS by landlords, NCC staff, and business community among other players. Together with Rosie they have hosted and facilitated more than 4 groups of international visitors interested in learning about UCLTS. Frank Marita my colleague is also with me. We are eager to share, learn and network with over 900 practitioners from around the globe who have converged in Kigali for the AfricaSan3. Clear indications that AfricaSan has become a movement and sort of market place where practitioners from institutions – CSO, communities, private sector meet to share learn and make commitments to better sanitation. This time round governments as well as CSOs are under pressure that only 9 countries in Africa are on track to achieve the MDG targets on Sanitation. Rwanda is the only country in Eastern Africa that is on track. We arrived on the 17th July (two days early) ready for the pre-AfricaSan3 CLTS sharing event organized by IDS Sussex in partnership with Plan International just like in the 2008 AfricaSan2 Conference in Durban South Africa. This time round the CLTS pre-conference event attracted about 70 participants almost double the number in 2008. In 2008 CLTS was just being introduced. This time round there was a lot to share – a clear indication that CLTS has grown. As we learned it is now being practiced in about 34 countries in Africa as compared to about 10 countries in 2008. CLTS has gained acceptance and momentum. About 5 million people across Africa (in countries where CLTS has been adopted) are reported to live in Open Defecation Free Communities. Sharing ranged from scaling up, sustainability of ODF status, menstrual hygiene, Monitoring and Evaluation inclusion and urban CLTS. CLTS is being mainstreamed and integrated government policies as a key strategy for scaling up rural sanitation. Kenya, Ethiopia, Ghana, Nigeria, Malawi, Zambia, Sierra Leone, Mali are among the countries demonstrating serious commitment to CLTS. The new frontiers are CLTS in urban areas and use of ICT for M&E and management information. Both of these were the focus of Plan International Kenya and Community Cleaning Services sharing in this AfricaSan3 conference. I remember Robert telling me though time was short we were able to put the key messages across. As if consoling us, he argued that people tend to remember more what is presented last. This was confirmed as quite a number of people came to enquire more about the UCLTS and use of mobile phones and GIS devices for mapping. We exchanged contacts and I am sure more enquiries will be coming our way. During the conference there were also regional fora to review progress made in achieving commitments made in AfricaSan2. The East Africa forum highlighted the need for considering urban CLTS as a key area of focus – there are many small towns growing very fast that have huge sanitation challenges and since CLTS had demonstrated the ability to galvanize citizen action and engagement with duty bearer to demand for better sanitation services we needed to utilize it more. The link of urban CLTS with evolving technologies and solutions (Sanitation Marketing) was evident. I was able to meet up with a young engineer from Sanergy the group that is piloting an Ecosan toilet in Mathare10 –we agreed to meet up in Nairobi. I wanted to know why the toilet they are demonstrating in Mathare was not readily available for purchase- yet there were a few landlords interested in buying. He told me they are working on an improved design which will be ready in September 2011. According to him the current design is not very good as it gets very hot inside during the day –really unconformable for the users during the day. Meeting an Engineer who works with Athi Water Service Board in charge of Nairobi region at the Kigali Airport was a key highlight for me. He overheard us as I was talking with another lady (Nelly) whom I had worked with on a research project on Tenants Rights in Mombasa (Kenyan Coast) in 2002-2003) . Though by chance this may turn out to be the most important moment for my trip to AfricaSan3 as far as the link to urban CLTS is concerned. I had heard that the Athi Water Service Board is renovating the main sewer line that passes through Mathare10. 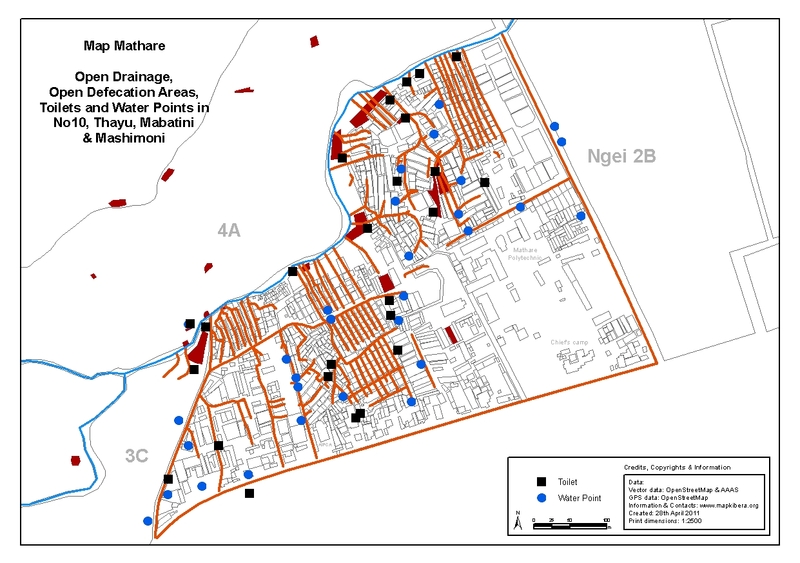 The maps generated from the participatory GIS wok show the magnitude of open sewers including hanging toilets that drain directly to the open drains and to the river. 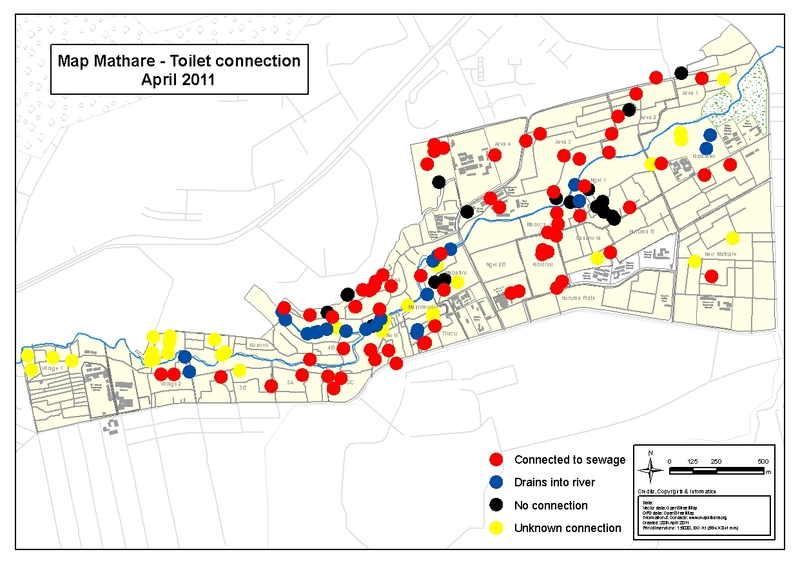 I showed him the maps – types of toilets in Mathare, the open sewer line and open defecation areas. He was very keen and was amazed at the work Map Mathare youth had done. I also informed him of the Mathare Valley blog which has real life stories from Mathare. I asked him if we could organize a round table meeting to share more on the outcomes of the UCLTs and mainly the mapping work. He agreed to this and he committed to bring the key people from Nairobi Water and Sewerage Company and the City Council City Planning Department and the Consultant who is renovating the sewer line. I can’t say how excited I was about such an opportunity. I am looking forward to the meeting as it presents an opportunity for exploring long term solution to the sanitation challenges in the informal settlements in Nairobi and in particular Mathare10.